Learn how paddles are made and repaired. Enjoy the hands-on experience of finishing your own paddle to take home. Makes a great gift for your family members and friends! This program is great for adults and families have a great time doing this together! You will learn so much about Hawaiian culture, about wood-working, about outrigger canoeing, and listen to stories about many Hawaiian legends, from on and off the water! This workshop is for 6 days, over three weekends. If you have to miss a session or two, not to worry! Location: Puakea Foundation Learning Center at Heʻeia. Directions will be sent to you after you register. Please be sure to join our email list in the right column so we can contact you about all of the Foundation events! 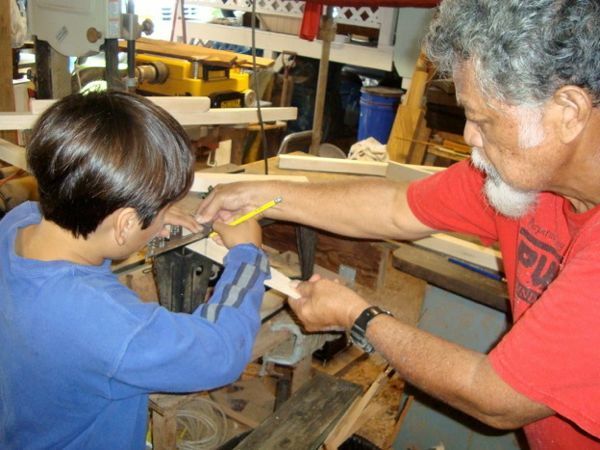 Workshop fee includes all supplies to make your own hand-made wood paddle. This program is limited to 10 people so act soon! Paddle Maker Chris Gardner made this awesome YouTube video from this year’s workshop!